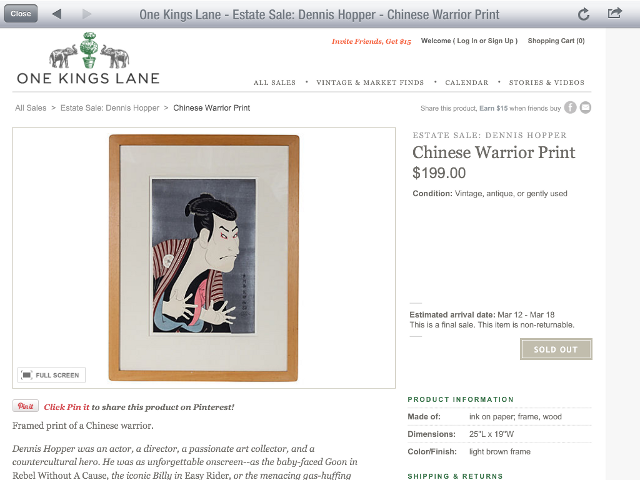 Easy Rider and recently deceased Dennis Hopper apparently had a collection of “Chinese” warrior prints that went up for bidding in One King Lane’s Estate Sale. Except that the warrior is not Chinese… or a warrior… That’s a woodblock print of a kabuki actor, very famously painted by Edo-era satirical artist Sharaku. Very famously, One King’s Lane. Good job.